A bright and elegant piece that adds a nice touch to any home. 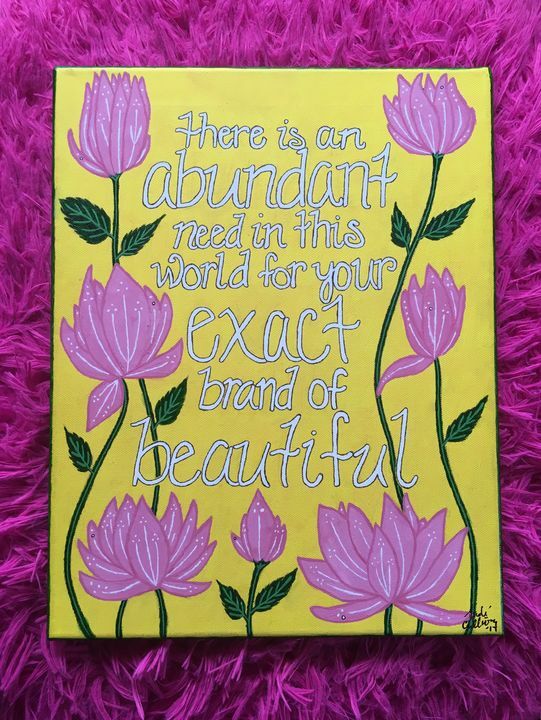 This piece features an uplifting quote that reads “there is an abundant need in this world for your exact brand of beautiful”. 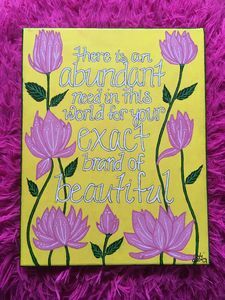 The quote is surrounded by blooming lotus flowers with decorative leaves coming from the stems. There is a forest green trim around the canvas to make the bright yellow background pop even more. My name is Sadé and I am a student at Georgia Southern University studying Apparel Design. I have been an artist for as long as I can remember and plan to continue creating for the rest of my life. I enjoy and participate in several forms of art including painting, sewing, drawing, and fashion illustration. I put a lot of time into my paintings and love working with acrylic paint.